When I first started eating a low carb diet, my first and hardest craving was pizza. I was having success with making a crust out of cheese and almond meal, but it just seemed like it took too much work for me (lazy, I know). At any rate, I saw an image for Baked Tomatoes in my newsfeed on Facebook (compliments of my friend, Vince) and knew I had to try these. I was instantly hooked! I know what you’re saying — this isn’t pizza. This is a baked Caprese salad. Traditionally, a Caprese salad is an Italian creation that is composed of fresh mozzarella, fresh basil, tomatoes, olive oil, and a splash of balsamic vinegar. Well, truth be told, this “salad” totally satisfied my pizza craving! With crispy parmesan cheese and the peppery bite from the basil, I felt like I was chomping down on an artisan, wood-fired pizza! It all starts with a fresh, summer time tomato.. 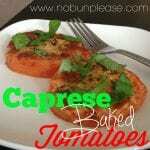 I am anxious to try this method with other toppings, aside from Caprese. Maybe some meat or maybe even pesto! I will sometimes eat two servings of this in place of dinner. Very filling yet light! Macro/Nutrition: For 2* topped slices, these come out to roughly 165 calories, 3 carbs, 2 NET carbs, 12 grams of fat, 1 grams of fiber and 8 grams of protein per serving! Drizzle with olive oil before putting into oven for roughly 20 minutes. What is your favorite substitute for pizza on a low carb lifestyle? Comment below!